"19-2" isn't a series known for pulling punches, in French Canada or in its English-Canadian remake that debuted earlier this year on Bravo. Season 1 of the English version depicted what series star Jared Keeso likes to describe as the "blood, piss and puke" of cop shows through graphic, documentary-style scenes, like a female officer being beaten with a baseball bat or an elderly man sobbing while his son stood over him screaming. Season 2 is about to up that ante. 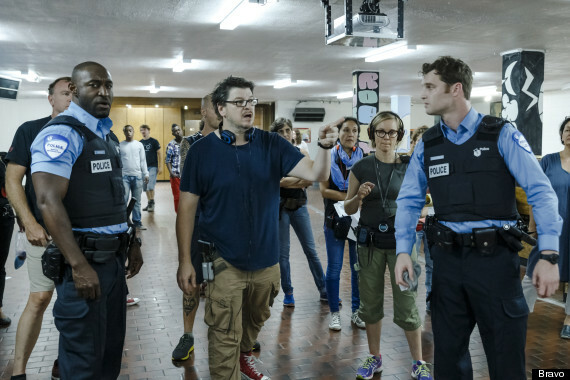 When the show returns in early 2015, it will bring a famed scene from the original Quebec series to the rest of Canada, whether we're ready to see it or not: a storyline based on the 2006 Dawson College school shooting in Montreal that resulted in one death and 19 wounded. The scene, a continuous shot that lasts just under 14 minutes, involved intense research and rehearsal, at least a half a dozen rooms, a two-storey building, roughly a hundred extras and profuse sweating from stars Keeso and Adrian Holmes. In order to capture the essence of the original French-language episode and weigh in on the magnitude of the scene itself, "19-2" brought original director Podz on for a one-off gig. Thirteen takes later -- one more than the original series needed -- they had their shot. "This is heavy, heavy, heavy. It is literally your worst nightmare," Keeso told HuffPost Canada TV from the set in Montreal over the summer. "I can't think of anything worse than guns in schools. Doing the research, seeing the kids' perspective, the parents' perspective and the police officers' perspective, it sucked. It was awful." In order to get into the mindset of these officers and what it's like to go through something like this, the crew consulted with policemen who were on-hand during the tragic 2006 events at Dawson. They spoke with an officer who had been shot in the face to understand the mindset of someone with a gun pointed at them. They listened to audio and watched video that captured the horror of it all, and they learned about the shift in tactical strategy for police in Montreal at that time, when officers were learning to actually enter the foray rather than just form a perimeter and wait for SWAT to arrive. "We were traumatized. We got the psychological prep to go into that reenactment of the Dawson shooting in a really heavy way ... we all cried," Montreal-based star Mylène Dinh-Robic said, tearing up all over again on the set. "This episode is Podz's baby; the way it was shot has his trademark on it. I was here in Montreal when the shooting happened. It was such a traumatizing event for the city and the cops did an amazing job. They're trained to do this, but this ocean of kids is running out, and you're running into the danger. You never want to have to experience anything like that -- as a parent, let alone as a police officer." When English Canada experiences the episode in early 2015 (Bravo has not yet announced an exact premiere date), showrunner and executive producer Bruce Smith knows that it will be a controversial subject. Not even Kurt Sutter on "Sons Of Anarchy" -- one of the most violent shows currently on television -- went so far as to actually enter the school and show the graphic content when he broached a similar subject in the Season 6 opener of his show. "We make our cops genuinely heroic by showing the real flaws and warts and by not sugar-coating the dark side," Smith said. "I think as an audience, you trust you're getting the truth about what the cost of the job is. It's very hard to watch, it's emotionally difficult, but this is the reality. These things happen. There was a lot of worry about that, when the French version aired here, and then the show didn't end up being that controversial. Because it really shouldn't be. It's the experience of policing. It's not sensationalized or glorified." "It's definitely going to raise a few eyebrows," Holmes added. "This is a very, very tragic event that took place here in Montreal, and some people aren't aware of it. To get a grasp on it and tell the story in as healthy a way as you can, I think it's good television. Sometimes you gotta really shock people and wake them up for them to see what's really happening." Whether viewers agree remains to be seen (a special Toronto screening at the Canadian International Television Festival on Monday night will be an early indicator), but either way this is the first time in English-Canadian history a scripted series has taken such a monumental storyline risk by showcasing this type of content. "It hasn't been done. Not like this ... not like this," Dinh-Robic said. "Obviously we never want to see that happen. But it did happen. As hard has it was to shoot, as much as I want to cry just remembering it right now, it played a part in opening people's eyes to real profound social issues." "Shooting that was the greatest challenge I've had as an actor and probably the greatest challenge I ever will have," Keeso added. "I hope I never have to do anything like that again. Is the audience ready for this? I hope they are, because we don't spare a thing." The Season 2 premiere of "19-2" is set to premiere in early 2015 on Bravo.